There’s no set return date scheduled for Marvin Bagley III but the standout Kings rookie has at least returned to basketball activities, Sean Cunningham of ABC10 Sacramento tweets. Bagley has been sidelined since spraining his left knee on Feb. 27. Earlier this week, Jason Anderson of the Sacramento Bee wrote about the 20-year-old’s recovery status after a scary injury, noting that he was “feeling good” and walking without a limp. That’s good news for a Kings team on the outside of the postseason looking in. The ninth-seeded Kings have managed to keep their heads above water in their pursuit of a playoff berth since Bagley has been out, managing .500 basketball in the four games that they’ve been without him. In 10 February contests, Bagley averaged 17.5 points and 9.4 rebounds per game. We wrote yesterday that Lakers coach Luke Walton said there was a chance point guard Lonzo Ball would miss the remainder of the season. Now, in the wake of the announcement that forward Brandon Ingram will miss the final month of the season, Ramona Shelburne of ESPN tweets that the “expectation” is that Ball will also be shut down following a doctor’s appointment scheduled for Saturday afternoon. The addition of scrappy veteran Tyler Johnson has brought a new sense of stability to the young Suns, Katherine Fitzgerald of The Arizona Republic writes. Head coach Igor Kokoskov anticipates that the 26-year-old trade deadline acquisition will start at the point guard position for the rest of the season. The Lakers will not fine Rajon Rondo for sitting in a courtside seat removed from his teammates, Dave McMenamin of ESPN reports. “I was just in my head contemplating the game. That’s kind of what I do. I don’t think I have to explain myself as far as my relationship with the team, the players and the coaches,” Rondo said. The NBA has rescinded DeMarcus Cousins‘ technical foul for tossing Jeremy Lamb‘s shoe during Monday’s game against the Hornets, a source tells Nick Friedell of ESPN.com. Cousins tossed the shoe out of bounds and was upset with the referee calling the technical. Cousins missed nearly a year while rehabbing from an Achilles injury. He’s appeared in 14 games for the Warriors so far this year and he’s been called for five technical fouls outside of the shoe-tossing experience. In his career, Cousins has received 123 technical fouls and has been ejected on 13 of those occasions. Jamal Crawford doesn’t necessarily feel like this will be his final season in the league, as he tells Sekou Smith of NBA.com. “I can keep going and going. And I will, as long as someone feels like I can bring something to the table, I’ll be here. No limits,” Crawford said. As we relayed earlier today, Heat head coach Erik Spoelstra is “sick” to his stomach about his inability to find minutes for veteran sharpshooter Wayne Ellington. And now that fellow guard and teammate Dion Waiters is set to return from his ankle injury, don’t expect playing time decisions to get any easier for Spoelstra. Not counting Waiters or up-and-coming youngster Derrick Jones, the Heat already have 11 players on standard NBA contracts who log 20.5 minutes per game or more, the most of anyone in the league. And of those 12 players, seven are swingmen who play primarily on the wing (Josh Richardson, Rodney McGruder, Justise Winslow, Dwyane Wade, Tyler Johnson, Ellington, and Waiters). In tonight’s blowout win against the Cavs, Wade logged a DNP-Illness, with the remainder of the minutes on the wing going to Richardson (32), Jones (31), Winslow (27), Johnson (26), McGruder (21), and Waiters (11). With Wade back in the mix soon and Waiters presumably playing his way into more minutes, the question becomes whether the Heat will move on from some of the aforementioned players, such as Waiters or Ellington, or keep the roster logjam as currently constructed as insurance in the event of another injury. That brings us to our question of the day: Do you think the Heat should try to move on from some of their wings or keep them all around for the rest of the 2018/19 season? If they alter their roster, who is the most likely wing to be moved? Ellington? Waiters? Somebody else? Please take to the comments section to weigh in. We look forward to your input. Hawks guard Trae Young firmly believes he’ll be a better player than fellow rookie Luka Doncic, explaining his reasoning to Andrew Sharp of Sports Illustrated this week. The two players have been compared for months after the Hawks and Mavericks agreed to a draft-night trade in June. The Hawks traded their No. 3 pick — used on Doncic — to Dallas in exchange for the No. 5 selection and a first-round pick in the 2019 Draft. Atlanta then made the decision to draft Young fifth overall and solidify him as the franchise centerpiece. Young has averaged 17.5 points and 8.2 assists in 14 games this season, shooting 41% from the floor and 27% from downtown. To compare, Doncic has averaged 19.1 points and 6.4 rebounds per contest, connecting on 47% from the field and 39% from 3-point territory. Chase Hughes of NBC Sports details how Wizards coach Scott Brooks has consistently altered his rotation this season, keeping his players on edge. Brooks’ changes are in response to the team’s poor start to the 2018/19 season. Hornets guard Jeremy Lamb will likely receive interest from multiple teams in free agency, putting his potential return after the season in question, Rick Bonnell of the Charlotte Observer writes. Lamb is averaging 12.9 points in 14 games, tied for his career-best. Derrick Jones looked like a star in Summer League, but it won’t be easy for him to get playing time, writes Ira Winderman of The Sun-Sentinel in a mailbag column. Jones was the Heat’s top scorer in the Sacramento league, averaging 21.3 points in three games, along with 7.3 rebounds. A two-way player last season, he appeared in 14 games for Miami and started eight. Jones, a small forward who signed a two-year deal in July, faces heavy competition for minutes. Josh Richardson will start at that position, and using Jones as a backup means moving Justise Winslow to either power forward or the backcourt and the Heat are already overloaded in both areas. It may take a roster move or two for Jones to get an opportunity. In the same column, Winderman tabs Richardson as the Heat player most likely to raise his game to an All-Star level in the future. Richardson became a full-time starter last year in his third NBA season and responded with a 12.9/3.5/2.9 line. The four-year, $42MM extension that Richardson agreed to last year will kick in this season, raising his salary to $9.367MM. Fans shouldn’t expect too much from Dion Waiters in his return from injury, Winderman cautions in a separate piece. Waiters played just 30 games last year before undergoing season-ending ankle surgery in January. 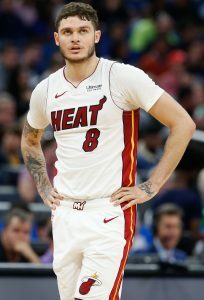 He should improve the team, Winderman notes, but will be competing for minutes with Richardson, Tyler Johnson and possibly Dwyane Wade. The Heat still have little hope of finding a taker for Johnson’s contract, Winderman adds in the same story. The Nets’ offer sheet that Miami matched in 2016 starts to balloon this year, paying Johnson $19,245,370 in each of the next two seasons and giving him the second-highest salary on the team. Winderman notes that the Rockets moved Ryan Anderson‘s similar deal this week, but Anderson agreed to a substantial giveback in the final year of his contract, which Johnson doesn’t have incentive to do. After agreeing to a buyout with the Lakers, Luol Deng is unlikely to return to Miami, tweets Barry Jackson of the Miami Herald. Deng would find minutes hard to come by in an already-crowded Heat rotation and wouldn’t want to risk being stuck on the bench like he was in Los Angeles. Deng spent two seasons in Miami before signing with the Lakers in 2016.